Find out what our experts have to say about Honda Activa 125! The 2018 Honda Activa 125 was recently launched by Honda Motorcycle and Scooter India (HMSI) with updated features and design. The updates include a semi-digital instrument console, LED headlamp, LED position lamps, four-in-one ignition key slot that unlocks the seat as well, retractable hook behind the front apron, an optional mobile charging socket under the seat and a bigger 'Honda' badge up front. There’s no change to the engine and the latest Activa 125 still draws power from a 124.9cc, single-cylinder, BS-IV compliant engine that churns a maximum power of 8.63PS at 6500rpm and a peak torque of 10.54Nm at 5000rpm, mated to a CVT gearbox. Honda claims that it can reach a top speed of 84kmph and returns a mileage of 60kmpl. There are three different variants of the Activa 125 - The base variant, the mid variant (with Drum brakes and alloys wheels) and the Deluxe version priced at Rs 59,921, Rs 61,858 and Rs 64,307 respectively (all prices ex-showroom Delhi). The Honda Activa 125 competes against the Suzuki Access 125, the Hero Destini 125 and the TVS NTorq. Honda Activa 125 is a great all round scooter which offers smooth engine, contemporary styling, decent performance and reliability factor which makes it a bang for your buck proposition. The least priced variant is Honda Activa 125 Standard priced at Rs. 70,132 and the most priced variant is Honda Activa 125 Deluxe priced at Rs. 74,906. Choose the Honda Activa 125 which fits the bill of you. Ever since the Activa was launched, it has always ruled the roost in terms of sales and the Activa 125 is no different, it is the best selling scooter in the 125cc category in the country. 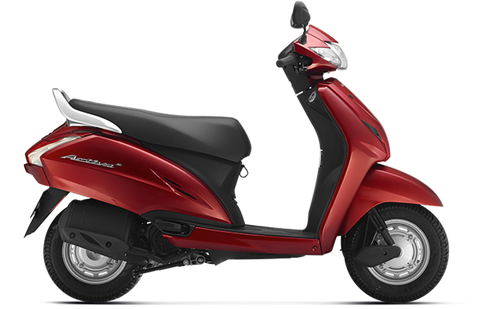 The 2017 Activa 125 update is the first scooter to get BS-IV compliant engine and AHO function. It comes with an addition of LED positioning lights, new premium Mat Crust metallic color, mobile charging socket, retractable front hook and a mid variant which comes with an alloy wheel and drum brake combination. The scooter also offers an optional disc brake with combined braking system (CBS) which reduces braking distance. There is not much of a price difference between the outgoing model and the BS-IV model. The updated Activa 125 is priced at Rs.58,081 for the standard variant, Rs.60,017 for the alloy drum variant and Rs.62,466 for the alloy disc variant (ex-showroom, Delhi). The most noteworthy change is the LED position lights which come embedded in the front panel. These along with the chrome chest on the front facia give the Activa 125 a very classy look. To Improve visibility the The Activa 125 is now has a new Automatic Headlamp On (AHO) feature it improves the visibility both in dark and daylight as well. The tail light now integrated with turn indicators gives the rear end a very sharp look to it. The grab rails offer great support to the pillion and are now stronger than before. Rest of the design and style elements are the same as the earlier model. It also get the same gets a digital-analogue instrument cluster that combines an analogue speedometer with digital readouts like odometer, trip-meter, fuel gauge. The Activa 125 is now also available in a special Mat Crust colour which gives a very premium feel due to the high quality matte paint job. The other color options available for the Activa 125 Midnight Blue Metallic, Pearl Amazing White, Rebel Red Metallic and Black. There is a new retractable hook in the front in addition to the one under the front end of the seat which helps you carry all your stuff conveniently. The front hook especially comes in handy for carrying shopping or grocery bags. Now charge up whenever and wherever you as the Activa 125 now includes a mobile charging socket in the 18 litres of underseat storage, which is decent enough to fit in a helmet or any other items. The Activa 125 now has a strong metal body and an all-round finish which is very tough and durable. The 124.9cc fan-cooled 4-stroke engine now powers the new Honda Activa 125. This new engine built with Honda Eco Technology (HET) is also compliant with Bharat Stage-IV emission norms. To make your ride more peppier the engine is mated to a V-Matic transmission system. The engine churns out a maximum power of 8.52PS at 6500 rpm and a peak torque of 10.54Nm at 5000 rpm. The top speed disclosed by the company is 84kmph and thanks to Honda’s HET you can expect a average fuel efficiency of 59kmpl. Now you can glide over every bump in style as the Activa 125 comes with the telescopic front suspension. The rear still has the same spring loaded hydraulic type suspension unit. If need arises the Combi Brake System (CBS) with equalizer by Honda gives you the stability to brake with confidence. The 5-spoke alloy wheels with front 190mm disc brake on the Deluxe variant gives you the power to handle tricky situations on the road. The other variants just get the same drum brakes at the front and rear. The Activa 125 has the 90/90 12-inch tubeless tyre on the front and 90/100 10-inch tubeless tyre on the rear. The Activa 125 assures you to be safe while riding in style. With the new Automatic Headlamp On (AHO) feature it improves the visibility not just in dawn, dusk or fog but also in bright daylight. The Activa 125 with disc brake in the front combined with Honda’s Combi brake system (CBS) with equalizer not only gives you a great sense of stability but safety as well.